Columnists keep wanting to distance us moderns from Trump, but he's as modern as it gets. Yes. From everybody. The real danger that’s facing us is we’ve lost respect for truth and facts. People have discovered that it’s much easier to destroy reputations for credibility than it is to maintain them. It doesn’t matter how good your facts are, somebody else can spread the rumour that you’re fake news. We’re entering a period of epistemological murk and uncertainty that we’ve not experienced since the middle ages. These are the words of someone totally unacquainted with the Middle Ages. It’s not just that the picture of the medieval period as an endless cycle of ignorance and repression is wrong (it is), but the picture itself is a modern one. It’s an effect of the Enlightenment and secularization, which retrospectively created premodernity. Ironically, by describing American politics as a regression to a medieval past, Dennett is reifying the very ideology that created ‘the Middle Ages’ in the first place. There’s no there there—no real confrontation with the past and no meaningful comparison. Dennett isn’t alone. Lou Mastriani writes for NorthJersey.com that “Donald Trump has taken us back to medieval times.” David Brooks thinks the Trump administration “is more like a medieval monarchy than a modern nation-state. It’s more ‘The Madness of King George’ than ‘The Missiles of October.’” (Note: George III reigned in the nineteenth century!) Katty Kay opines for the BBC that Trump’s White House “acts like some medieval court.” Louis René Beres at Arutz Sheva, describing Trump’s presidency as “forged in an atmosphere of determined unreason and anti-thought,” identifies it with the prediction of what he terms “resurrected medieval darkness” in W. B. Yeats’s poem “The Second Coming.” And this is just from the past week. These statements are historically ignorant. They’re also a window onto modern liberal subjects’ sense of the world. The real payoff of assigning current politics to the distant past is to protect the notion of a just society, ruled by reason. The notion of a society ruled by reason stands in need of protecting because, well, it keeps bumping up against reality. Indeed, this notion has always been a fantasy, a way of papering over the violence and imperialism of modernity. You don’t get Hume without the transatlantic slave trade. You don’t get Kant without the Holocaust. The just and rational world projected by Enlightenment philosophers turned out to be a space of whiteness called “Europe,” cloaked in universalism. Enlightenment has winners and losers across the world in 2017. None of this is to say that the various ideas and practices we now call the Enlightenment were a bad thing. Historicism teaches us that transhistorical judgments are problematic, in any case, since there exists no position outside history from which to judge. The crucial point is that the Enlightenment inculcated new forms of hegemony even as it promised new forms of liberation. 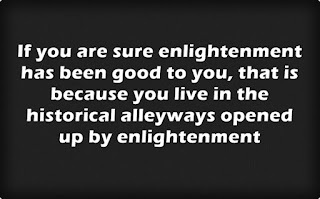 If you are sure enlightenment has been good to you, that is because you live in the historical alleyways opened up by enlightenment. 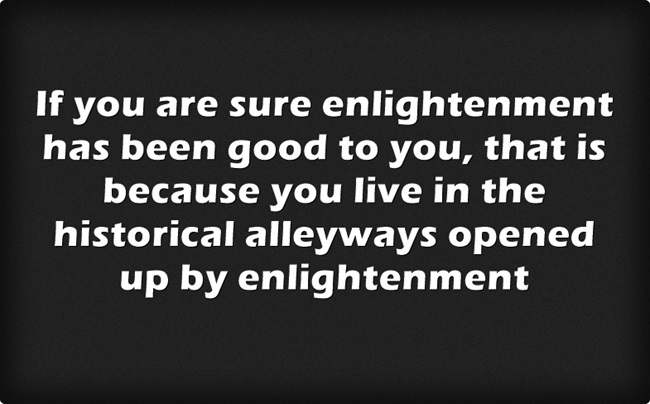 You are the product of enlightenment and its beneficiary. One of the minor exports of Enlightenment thought was the idea of the Middle Ages, the negative mirror image of secularist modernity. So when Dennett makes an offhand reference to “the middle ages,” all that historical baggage is packed in yet goes unacknowledged. He means, approximately, ‘a period of epistemological murk and uncertainty that we’ve not experienced since what I imagine my rationalist, secularist self would feel in the Middle Ages.’ So stated, the sentiment is obviously devoid of historical content. Ultimately, Dennett’s appeal is an appeal to whiteness, scientism, secularism, and related ideological formations. Any of my colleagues in medieval studies will recognize this rhetorical move. It’s the same move that made Anglo-Saxons and West Africans appear primitive to nineteenth-century white Europeans. (Notice how modernity transects both space and time.) Medievalists have learned to disarm this line of reasoning by asking, “‘Primitive’ to whom? On what grounds? For whose benefit? At whose expense?” The idea that Trump is making America medieval again deserves to be greeted with the same skepticism, and for the same reason. Dennett’s historical attitude is bound up with his own reflexive disdain for religious belief and religious institutions, a habit of thought characteristic of secularist modernity. (Every medievalist has been asked by a friend or family member, “How can you study such a religious period?”) Tellingly, Dennett remarks that “the rise of theocracy in America” is one of the few threats that can spur him to political activism. He admits to resenting politics in general, because “I simply must take time out from what I’d really like to be doing to think about the political near future.” Needless to say, the luxury of escaping politics is only afforded to those with substantial privilege and security. Dennett’s comments on organized religion suggest what’s at stake for him when he does choose to drop the pretense that his work is apolitical. Like Stephen Greenblatt, Dennett is invested in anti-religious polemic, in vindicating secularization as absolute social progress. Like racial slavery, the scientific method, ISIS, the automobile, and phenomenology, Trumpism is an irreducibly modern response to modern conditions. Trump isn’t taking us back to the Middle Ages because history only points in one direction. We can learn much from the violence of the past, but not by wishing away the violence of the present. Eric Weiskott teaches medieval English poetry at Boston College; he's working on a book about the division of the past into medieval and modern periods.